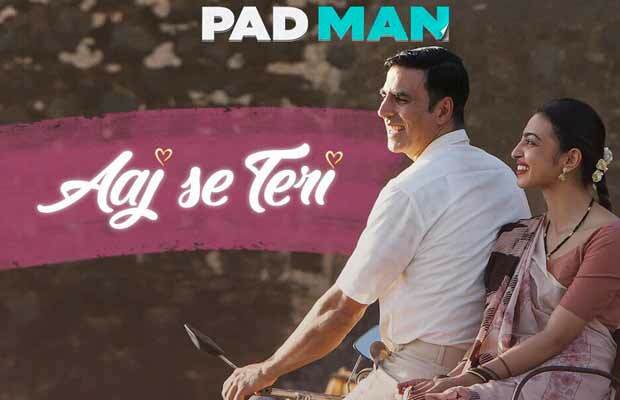 Aaj Se Teri, the first song from Akshay Kumar starrer Pad Man is out now! After impressing everyone with Toilet: Ek Prem Katha, Akshay Kumar is all set to win everyone’s heart with his upcoming film. He is going to be seen in the film Pad Man, whose trailer was released on December 15, in the last week. And it was not long when it topped the trending charts of YouTube. The social media was flooded with appreciation from both the common people as well as the people from the film fraternity. Today was the first song launch of the film. The event was attended by the team of the film including Twinkle Khanna, Akshay Kumar, Radhika Apte, R Balki and others. Now the first song from the film, Aaj Se Teri is out and we have to say that Akki seems to be the most loving and caring husband ever. The song shows how he tries to save every small problem of his wife and it looks so adorable. Arijit Singh has lent his voice to the song composed by Amit Trivedi. The beautifully cute lyrics have been penned down by Kausar Munir. Pad Man, the film, is based on a true story. It touches upon the sensitive subject of menstrual hygiene for women. This topic has always been treated as a taboo, especially in our country. So, many people have praised Twinkle Khanna along with Akshay Kumar, for bringing it up! Next articleBJP MLA Calls Virat Kohli ‘Unpatriotic’ After His Italian Wedding With Anushka Sharma!